Please note that all coupons must be presented before time of write-up. Simply show this page to the service writer or click on the coupon for a printable version. Get 10% Off your Next Service or Repair! 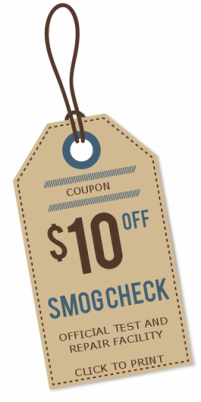 Get $10 of your next smog check. Includes official California smog certificate. Free retest or check engine light diagnostics if we do repairs. Cannot combine with other offers. Get $15 off your next 2-wheel or 4-wheel alignment. Includes camber, caster, and toe adjustment. Cannot combine with other offers. Get $5 off your next oil and filter change. Regular or fully synthetic engine oil. Top off all fluids, adjust tire pressure, and check other systems.